While the SSU once lagged in walker technology, they have since developed the KV47, a walker platform capable of trading blows with any opposing armor. This machine can be fielded in three different variants: the Nadya, Natasha, or Natalya. Wether you want to field the Nadya with its Sulfur Throwers, the Natasha and its 45mm Howitzers, or the Natalya featuring twin Circular Saws, there is a KV47 for any situation. 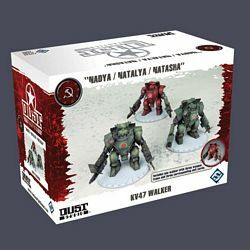 Take command of this devastating SSU walker.